Personalized medicine is drugs prepared based on the response produced by the patient suffering from a particular disease and carry certain biomarkers to cater the requirement of an individual patient. The key objective of personalized medicine is to recognize most appropriate treatment option for patient population. Globally, development of efficient and advance technology, higher prevalence of diseases, rise in the awareness among people regarding personalized medicine, increasing government initiative across the globe, growing development of genetic databases are the prime growth drivers of global personalized medicine market. 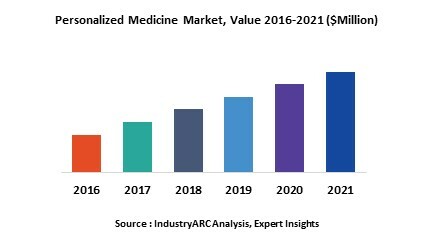 In addition, increase in adoption of personalized medicine for cardio-renal, neurology, antiviral, pulmonary, psychiatry, and others, and emerging economies such as China, India and others, will create new opportunities for global personalized medicine market. However, higher cost of the research and development, and higher risk of side effects are the key restraints for global personalized medicine market. Geographically North America dominated global personalized medicine market because of higher adoption of clinical practitioners, government funding, central integration of EHR and healthcare IT systems with hospital operations, high medical reimbursement facilities, and technological advancement. Asia Pacific is projected to have fastest growth, owing to rapidly increasing aging population, rise in consumer awareness, modernization of healthcare infrastructure, and growing medical tourism industry in developing nations such as China, and India in this region. Among all the end-users, hospitals has the highest market share in global personalized medicine market. This report identifies the global personalized medicine market size in for the year 2014-2016, and forecast of the same for year 2021. It also highlights the market drivers, restraints, growth indicators, challenges, and other key aspects with respect to global personalized medicine market. 11.1. Siemens Healthcare Diagnostics Inc.
11.3. Becton Dickinson & Co.
Table 58: Top Companies 2017 (US$) People screening technologies Market,Revenue & Volume. Table 59: Product Launch 2017-2018 People screening technologies Market,Revenue & Volume. Table 60: Mergers & Acquistions 2017-2018People screening technologies Market,Revenue & Volume.